The team was super excited to hear we’d selected the Grant Park and Memorial Drive Corridor. As usual, they had a fab time while “working”. Enjoy. I have been wanting to try this place since they opened in late 2017. I was intrigued by the new look which appeared, from the press releases, to have a fun glam/cool vibe. It was that and more…. For food, we jumped into the Fried Okra sticks, the Burrata and the Steak Au Poivre. Okra was a big winner as was the steak that came with glorious onion rings. Tip: order it a bit less cooked than you normally like. We got that piece of advice from our bar-neighbor. He was right, and our MR beef was perfection. 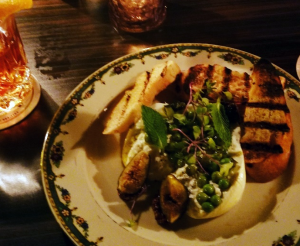 The Burrata was the only disappointment. The cheese was lovely but the accompaniments were so-so. It’s not fig season yet so the figs with the dish were not the juicy/sweet fruit we know and love. I also recommended to the bartender that it could use a balsamic or some other acid. This version was served with a smidge of mustard but not enough to compliment the creaminess of the cheese. Other reviewers on Yelp enjoyed the Crab Ragoon and Okonomiyaki. 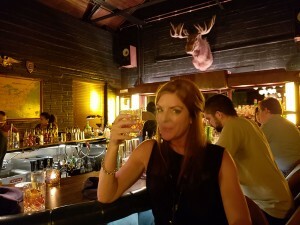 Prices were reasonable for the quality and drinks were generous. We’ll be back! Check out the Golden Eagle Website for more details. 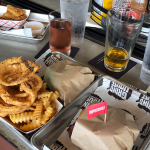 Leslie and I decided it was time to check out one of Atlanta’s growing trendy restaurant concepts – the gourmet burger spot. 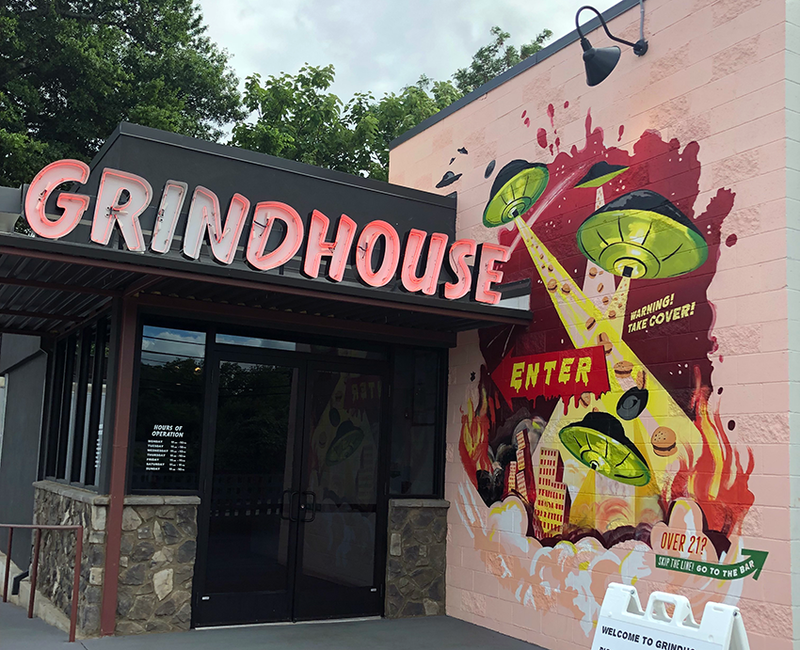 Grindhouse sits on Memorial Drive just a few blocks from Oakland Cemetery and is one of several Atlanta locations. Previously this building was home to one of my favorite restaurants – Redfish. Opened by Jack Sobel (Agave) & Gregg Herndon (Tiburon), Redfish was a great hangout with stellar food, full bar and impressive wine list. This part of Memorial is seeing some dramatic changes as new developments are popping up all over. While some of the infrastructure plans have yet to be completed, numerous new bars and restaurants are opening. So if you haven’t checked this area out yet, you may want to soon before it gets more popular and crowded! 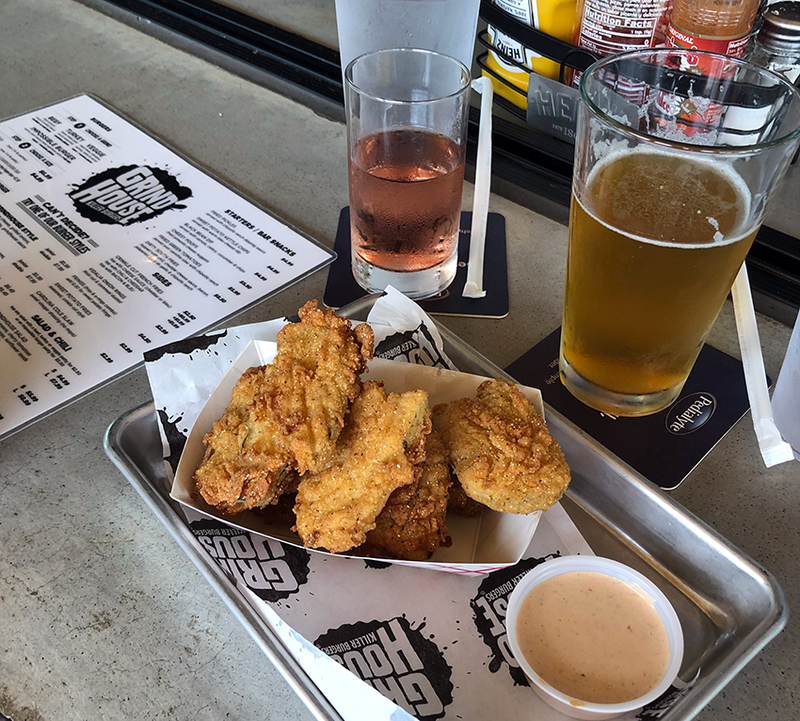 We started with drinks and some fried pickles. 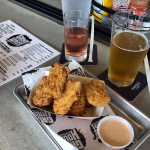 I chose Sweetwater’s Triple Tail IPA and Leslie selected a Rosé. We were both very happy with our choice! Shortly thereafter, our piping hot and delicious pickles arrived, yummy. I didn’t check the menu before choosing or heading over. Instead, I figured worst case, we’ll eat appetizers. To my pleasant surprise, this burger joint has veggie options! Leslie ordered the Veggie Burger -Grindhouse style with American cheese, grilled onion, lettuce, pickles, & the grindhouse sauce. I selected their other veggie option – the “Impossible” Cowboy style with Cheddar cheese, applewood bacon, crispy Vidalia onion ring, & bbq sauce. Note: yeah, there was bacon on it briefly which went home in a doggy bag for our critter, Lola. Despite the lack of bacon, we both really enjoyed the faux burger the most. The veggie burger was a bit soggy and fell apart when we attempted to pick it up and share. No visit to a burger joint would be complete without fries or onion rings! 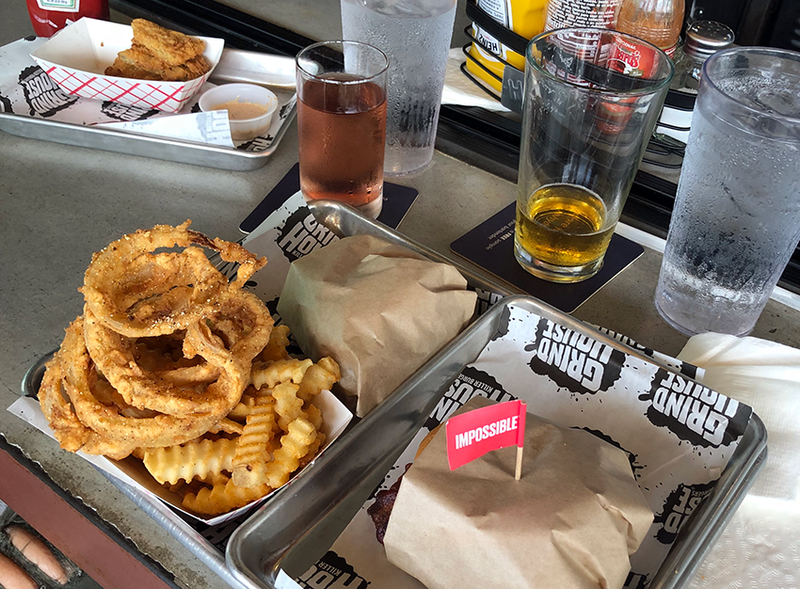 And, since we couldn’t choose, luckily Grindhouse delivers with their Frings – crispy crinkle fries and onion rings – yeah! So, can a vegetarian enjoy a burger joint? I say, absolutely and Grindhouse is now on my list of places to frequent. Check out their website and then head on over for a tasty meal. 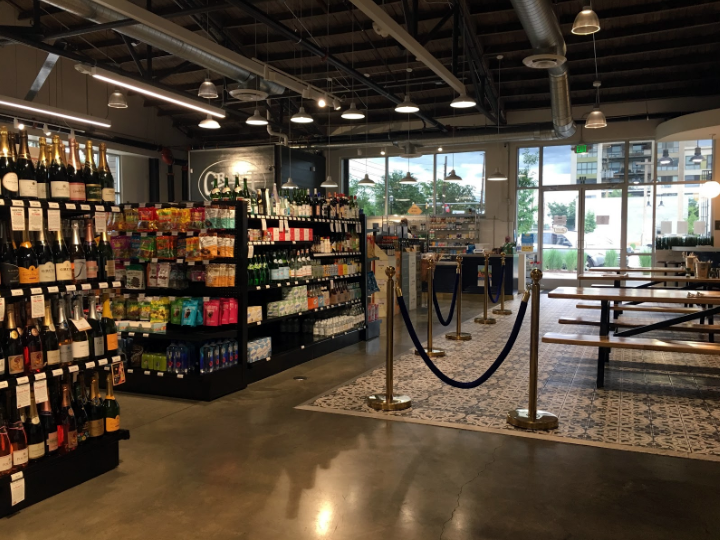 Grant Park Market, the second location of Candler Park Market, located in the Larkin re-use development off Memorial Drive, is open and business is in full-swing. I stopped by to grab a beer with a friend and check out the food stall Gather. 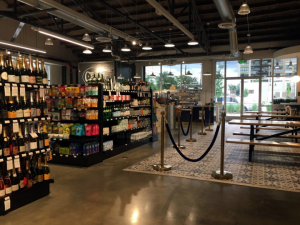 The Grant Park Market itself offers much of the same highly curated beer, wine and food options as its predecessor. It also reminded me of Savi Market in Inman Park. How convenient it was to sit down for dinner then browse their selection of fancy chocolate bars for dessert (I settled on a milk chocolate Ritter biscuit – it did not disappoint). Gather had a fresh and varied menu with a couple of vegan/vegetarian options (my closest friends – who I end up sharing many meals with a week – are lifetime vegans so I am always looking for this at restaurants). The decor is clean and modern – community style seating with minimalist, polished wood tables and benches. The patterned tile flooring and simplistic cutesy map of Atlanta neighborhoods also caught my eye. I had a hard time deciding between the cheesesteak sandwich, garlic fries, charcuterie board, tuna cruda, veggie bowls, cheese ravioli, and everything but the kitchen sink! The menu had all of the great options. I eventually settled for the special, a crab stack, and a side of garlic fries. They also had a few beers on draft – I grabbed a strawberry gose. I’m a bad reviewer, I don’t remember the name but it was splendid. Tart and not watered down – on par with Orpheus sours. Guys – the crab stack was delicious. 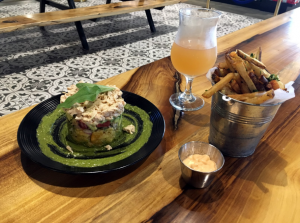 Dressed crab meat on top of avocado, tomato, PLANTAINS and a tasty sauce I was too distracted-by-all-the-tastiness to stop and ask about. Talk about hitting all your macros. Garlic fries were decent (if you’ve had Fred’s Meat and Bread garlic fries – you know they set the bar fairly high) and sriracha veganaise dipping sauce was adequate. Gotta give points for vegan conscientiousness. Overall, 8/10, would go again. Top marks for convenience, menu variety, draft beer, easy parking, fresh food, and milk chocolate Ritter biscuits. Learn more at the Grant Park Market website.